Is there any significance to an animal in a crest being ducally gorged? I ask because I recently met someone with the surname "ABER" and just for fun researched the name which I found in Burke's. The crest is a Talbot,Ducally Gorged. I thought with a Duke's Coronet in the crest this person should be someone of note, but I can't find anything. Maybe someone here in the forum could shed some light who this person was. Could you provide the text of the Burke's entry for Aber. That may help us with the identity of the Aber family. Boutell has quite a lot to say on ducal/crest coronets (pp 155-156). All I have is the entry from Burke's General Armory 1884. Aber. or, a fesse embattled az. Crest- a demi talbot ramp. ar. ducally gorged gu. I seem to have a knack for finding people in Burke's who don't exist anywhere else. This really makes wonder about Burke's. I know Aber is German, but I found nothing about it in my German resourses. The person I met with the surname Aber has been researching his genealogy and so far is solidly English. Mr. Green, I checked Boutell's Heraldry 1890. It says " This coronet, although blazoned a ducal coronet, has no reference to ducal, or any other rank". I learned something new. I thought having a coronet around the animal's neck in a crest meant something special. Oh well. The blazon does not enlighten us much. The arms are traditional rather than "Victorian". 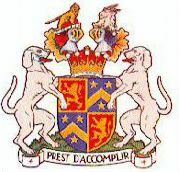 The talbot breed of dogs seems to have died out at the end of the 18th century, so perhaps the arms are older (though of course one may use an image of an extinct dog just as one may use the image of a mythical beast).